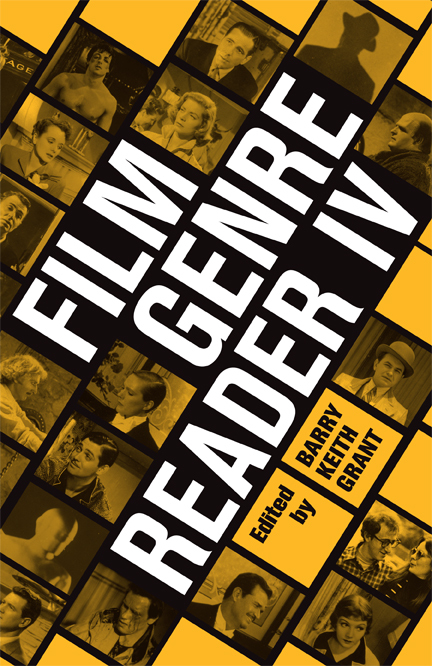 Newly revised and expanded nearly a decade after the third edition, Film Genre Reader is the standard reference and classroom text for the study of genre in film, with more than 25,000 copies sold. Since 1986, Film Genre Reader has been the standard reference and classroom text for the study of genre in film, with more than 25,000 copies sold. Barry Keith Grant has again revised and updated the book to reflect the most recent developments in genre study. This fourth edition adds new essays on genre definition and cycles, action movies, science fiction, and heritage films, along with a comprehensive and updated bibliography. The volume includes more than thirty essays by some of film’s most distinguished critics and scholars of popular cinema, including Charles Ramírez Berg, John G. Cawelti, Celestino Deleyto, David Desser, Thomas Elsaesser, Steve Neale, Thomas Schatz, Paul Schrader, Vivian Sobchack, Janet Staiger, Linda Williams, and Robin Wood. Barry Keith Grant is Professor in the Department of Communications, Popular Culture, and Film at Brock University. He is the author or editor of many books, including Film Genre: From Iconography to Ideology and The Dread of Difference: Gender and the Horror Film . Stated simply, genre movies are those commercial feature films that, through repetition and variation, tell familiar stories with familiar characters in familiar situations. They also encourage expectations and experiences similar to those of similar films we have already seen. Genre movies have made up the bulk of film practice, the iceberg of film history beneath the visible tip that in the past has commonly been understood as film art. They have been exceptionally significant as well in establishing the popular sense of cinema as a cultural and economic institution, particularly in the United States, where Hollywood studios early on adopted an industrial model based on mass production. Traditionally, Hollywood movies have been produced in a profit-motivated studio system that, as the result of sound business practice, has sought to guarantee acceptance at the box office by the exploitation and variation of commercially successful formulas. In this system, praised for the "genius" of its efficiency by André Bazin, genre movies are the Model Ts or the Colt revolvers of film, with interchangeable parts. Yet despite this central place of genre in the cinema, critical recognition of its importance is a relatively recent development. The first significant essays of film genre criticism, Robert Warshow's articles on the gangster film and the western (originally published in the Partisan Review in 1948 and 1954, respectively) and Bazin's two pieces on the western from the early fifties, were all written within a few years of each other. Chronologically, genre criticism thus narrowly predates the early work of auteurism, but it developed more slowly because it failed to enjoy the popularization that heralded the arrival of director-oriented "theory," first in Great Britain—primarily in the journal Movie —and then in North America through the writings of Andrew Sarris. Valorizing the artist responsible for the dubious art of film, auteur criticism proved at the time more amenable to the serious discussion of cinema. It is not surprising that Warshow and Bazin focused on westerns and gangster films since these have been perhaps the two most durable of American film genres, beginning with The Great Train Robbery (Edwin S. Porter, 1903) and The Musketeers of Pig Alley (D. W. Griffith, 1912). Today it seems clear that these essays suffer from an impressionism and prescriptiveness that, while unfortunate, are also not uncharacteristic of later genre criticism. Yet their flaws are readily understandable, given that these first essays were unprecedented and were written at a time when genres were undergoing radical change after a period of relative stability. Indeed, despite their problems, they have also pointed the way for many of the concerns of later critics. For example, in the essay on gangster films, Warshow was extremely perceptive about the essential dynamics of the genre and the satisfactions it typically provides the viewer; thus, he anticipated one of the central topics of more sophisticated contemporary film theory—the positioning or construction of the spectating subject. His cogent observation that "the real city . . . produces only criminals; the imaginary city produces the gangster" reveals that in some way he understood genre as a system of conventions structured according to cultural values, an idea not dissimilar to what structuralists would later call the "deep structure" of myth. Warshow's distinction initiated the now generally accepted separation of historical verisimilitude (but not history) from the analysis of genre, which is the way it had most often been discussed before. In addition, his acknowledgment of a difference between actual social restraints ("the real city") and the structures of the imaginative escape from it ("the imaginary city") adumbrates the project of much later work in deconstructing the processes—what Roland Barthes calls the "mythologies"—by which ideology contains and reinforces itself. While the works of these two critics may be seen as crucial to the development of a more rigorous genre criticism, they were, in another sense, only attempts at articulating concepts already implicitly understood by filmmakers and viewers alike. Well before Warshow and Bazin's articles were first published, the idea of genre circulated in public thinking, if not in critical discourse. Films were loosely typed by producers, audiences, and even reviewers: a movie was a "western" or a "war movie" or a "musical," and such descriptive labels came to signal information to prospective consumers about the story and the kind of pleasure it was likely to offer. Only after this circuit of economic and aesthetic relations was firmly established was it possible for critics to realize that if those handy descriptive tags actually referred to true traditions of film practice, then they might be worth identifying, analyzing, and theorizing about. Genre thus became a critical term as well as a collection of popular categories, and it has since proved to be one of the most useful conceptual tools for understanding popular film as both art and artifact. As film study developed in the 1970s, interest in the narrative film, nurtured a decade earlier by auteurism's enthusiasm for popular American movies, began to wane in favor of more formal concerns. Critical interest shifted from the signified of films to the practice of signification, from what a film "means" to how it produces meaning. Accordingly, both nonnarrative, experimental films and those that somehow broke with the seamless, "classical" construction of Hollywood narrative (what Noël Burch has called the "institutional mode of representation") received an increasing degree of critical attention. At the same time, a heightened concern with the operation of ideology in art, stimulated by the importation to film of theoretical work by John Berger, Louis Althusser, Brecht, Freud, and others, shattered the operating assumption that an understanding of a film's director and his or her oeuvre would provide the key to interpretation. Rather, meaning was now seen to arise from the conjunction of various discursive codes at work in the film text, of which the directorial code was only one. Fuller, Hawks, and Hitchcock became, in the famous formulation by Peter Wollen in the revised edition of Signs and Meaning in the Cinema (1972), "Fuller," "Hawks," and "Hitchcock"—that is, filmic structures designated by the name appearing on the director's credit. As Barthes had shown, writing degree zero, a discourse that exists outside ideology, is impossible. Eventually, this emphasis on signification and ideology brought about a renewed interest in the classical narrative film, and genre films in particular became an important site of inquiry. The general view of popular film now was that it was little more than bourgeois illusionism, essentially conservative in both style and theme. Genres therefore existed primarily as mythic edifices to be deconstructed. They were valuable for study because generic analysis could easily involve the consideration of economic and historical contexts (conditions of production and consumption), conventions and mythic functions (semiotic codes and structural patterns), and the place of particular filmmakers within genres (tradition and the individual auteur). Thus, genre criticism has been able to accommodate the interests of newer approaches to film, and in fact may be seen as a locus of the overlapping but often separate concerns of auteurism, Marxism, semiology, structuralism, and feminism. Similarly, the more contemporary interest in issues of gender, race, class, and sexuality, and in audience reception in cinema also finds much ground for analysis in the fertile fields of genre. If, in the eighties, leftist critics were able to shift away from the view of genre as necessarily mythic embodiments of the dominant ideology—for example, a convincing case was made for reading many horror films as critiques of American society rather than as endorsements of its fears and repressions—so, more recently, previously marginalized voices have been finding spaces from which to speak within the discourse on genre, as in the case of queer readings of popular films. While it is true that genre movies tell familiar stories with familiar characters in familiar situations, it by no means follows that they do so in ways that are completely familiar. Part One begins with Andrew Tudor's consideration of some of the problems arising in the very attempt to delineate individual genres. Edward Buscombe next offers a partial solution to Tudor's dilemma by theorizing a distinction, adapted from literary criticism, between a film's "outer forms" (iconography) and its "inner forms" (themes) and by discussing their relationship. Rick Altman suggests a way to approach the range of works within individual genres by introducing concepts borrowed from linguistics. Leger Grindon emphasizes the importance of cycles and clusters in understanding generic history and change. The social and political implications of genres and of individual genre films are discussed by both Judith Hess Wright and Jean-Loup Bourget, who present almost diametrically opposed arguments. For Wright, genre films act as conservative reaffirmations of dominant values because they are grounded in the predictability of conventions, while Bourget sees them as possessing the ability to become subversive statements for precisely the same reason. Robin Wood considers this issue in relation to the place of the auteur by contrasting some of the genre work of Alfred Hitchcock and Frank Capra. The political issues raised by Wright, Bourget, and Wood are then placed by Barbara Klinger within the influential theoretical framework for categorizing the relation of all narrative films to ideology originally proposed by Jean-Louis Comolli and Jean Narboni. Next, Thomas Schatz offers an overview of the ways in which structuralism has been applied to film genre, and the experiential nature of genre films is discussed in Thomas Sobchack's essay as well as in my own. Richard de Cordova discusses aspects of performance in relation to genre, an element of cinema largely ignored by scholarly writing. Linda Williams rethinks traditional generic distinctions by offering some provocative points of comparison among three of what she calls "body genres," and Steve Neale usefully summarizes several important issues examined in genre theory, as well as suggesting some directions for future work. The section concludes with Janet Staiger's lucid unpacking of the debate regarding genre hybridity and Celestino Deleyto's questioning of genre boundaries. Together the essays in Part One introduce a range of approaches to film genre, many of which are applied in the second section. Each of the selections in Part Two treats a particular genre from a somewhat different perspective, and together they provide a comprehensive overview of applied genre criticism. Since the western has been central to American popular culture and subjected to the most sustained critical analyses over the years, Part Two begins with a discussion of this genre by Douglas Pye, employing the concept of modes as outlined in the work of Northrop Frye. Next, the history and social myths that contributed to the development of the gangster film, a genre that shares many elements with the western, are examined by Edward Mitchell. Paul Schrader discusses film noir primarily from a stylistic perspective, and although he begins by asserting that film noir is actually not a genre, it would seem that his analysis, and the work of later critics, has demonstrated that it may indeed be considered one. John G. Cawelti and Tag Gallagher both address the question of generic alteration or "evolution," and once again there is a marked difference of opinion: Cawelti identifies distinct modes of change in genre films during one particularly volatile historical period for American cinema, the 1970s, but Gallagher seriously challenges the accuracy of the commonly held evolutionary view. Maurice Yacowar's essay on the disaster film seeks to define a typology of that genre, while Vivian Sobchack examines the relations between the form of the epic film and the spectator's viewing experience. Bruce F. Kawin offers a useful distinction between horror and science fiction, two closely related and overlapping genres. In the following essay, Margaret Tarratt discusses some of these movies from a Freudian perspective, an approach also found in the analysis of melodrama offered by Thomas Elsaesser, which follows the other essay on science fiction by Charles Ramírez Berg. Berg reads a number of science fiction movies released over the last several decades in the context of the stereotypical representation of Latinos and questions of immigration, which have become increasingly pressing for the United States. Next, the ideology of romance offered by the screwball comedy is examined by David R. Shumway. A similar concern with gender and desire informs Chris Straayer's identification of what she dubs the "temporary transvestite film," and Susan Jeffords's consideration of both women characters in and the spectating subject of Vietnam War films. Yvonne Tasker discusses the construction of the family in recent action films, and Jane Feuer analyzes the mythic strategies by which the classic musical valorizes itself. Mark A. Reid considers the representation of race in his discussion of black gangster films, and Timothy Shary outlines the parameters and permutations of the teen film, a genre uniquely defined in terms of the age group represented in the narrative. As one might expect, genre criticism has concentrated on (mainstream) American cinema, and the essays collected in this volume are no exception. But such questions as the relation of genre to ideology have ramifications beyond Hollywood. From Japanese samurai films to Italian westerns to French gangster films to Hong Kong action movies, almost all national cinemas have been influenced to some degree by American genre movies. In the concluding essays of Part Two, Andrew Higson identifies a new genre in British cinema that he calls the heritage film, and David Desser considers the international dimensions of commercial filmmaking in the context of "global noir." The essays in this collection may of course be read in the order presented, or in groups concerned with similar issues. For example, an examination of genre and ideology would include, among others, the essays by Wright, Bourget, Wood, Klinger, Feuer, Jeffords, Tasker, and Higson. The relation between genre and auteur is examined in the selections by Bourget, Wood, Cawelti, and Gallagher. The complexities of genre and the viewing experience connect the essays by Thomas Sobchack, Williams, Kawin, Vivian Sobchack, Straayer, Jeffords, and Grant. Issues of representation and difference unite such otherwise different essays as those by Berg, Straayer, Jeffords, Reid, Shary, and Desser. Other groupings are certainly possible, and however one chooses to use the book, it should provide both the general reader and the student of film with a comprehensive view of film genre. The marked difference of opinion among many of these essays indicates less the lack of an editorial position than the attempt to generate lively debate of the issues.